Waiting for the show to start, my Dad and I were a little nervous. Everything seemed to be working, but we felt like just about anything could go wrong. 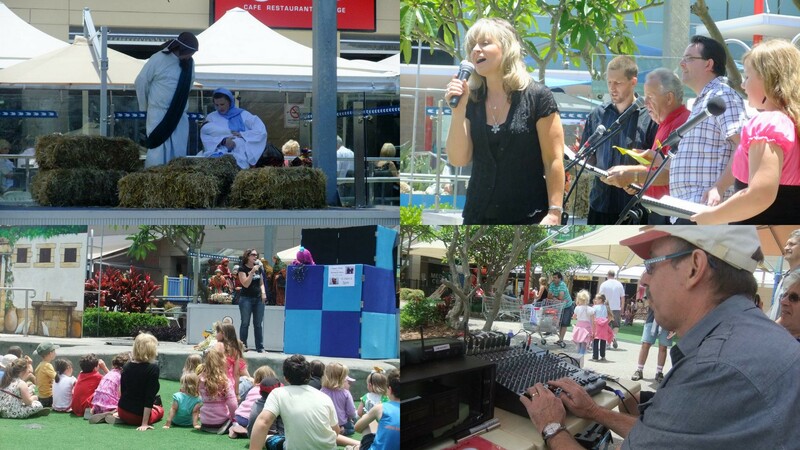 Dad and I had teamed up to provide the audio coverage of The Christmas story at the Hive in Erina Fair – our local shopping centre. Local churches Erina Baptist and Green Point Baptist came together to perform the Christmas story with Mary and Joseph riding in on a donkey, shepherds with sheep and wise men riding on camels through the shops! Passing shoppers stopped to watch the kids pre-show and listen to the carols and commented that they loved the singing. After the show, we could take a deep breath and thank God that the show went well. I also though to myself that I am really lucky to live in a country where we are allowed to put on a Christmas play about Jesus and nobody tries to stop us. I am also really thankful that churches and individuals have stuck their hand up and said ‘We want to do this’. Without them, this message would be completely absent from my favourite shopping centre and public meeting place. As Christmas approaches rapidly I am helping with these shows – two more will happen on Thursday and Friday night at the Hive at 6pm – and I’m busy preparing Grace Wamberal’s Audio/Visual gear for the possibility of Christmas Eve inside if it rains. And as the day draws nearer and everyone around is making last minute preparations for Christmas, I too start to feel the stress. Isn’t it nice though, to go to Christian run carols events, or to events like ‘Road to Bethlehem’, to watch movies like ‘The Nativity Story’ or simply to read through Luke 1 & 2 and marvel at the miracle that happened on that first Christmas. God became man, dwelt among us – and he came to restore us to right relationship with himself. It all causes me to think – how is my relationship with Jesus right now?